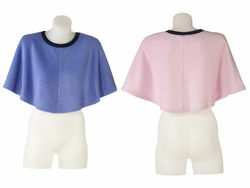 Our lovely soft short day poncho is perfect for that little bit of extra warmth across your shoulders and top of back. They are very comfortable and look fantastic over our adaptive clothing range including our adaptive nighties, adaptive blouses and adaptive dresses. Perfect for any weather.